Published to coincide with the 50th anniversary of its initial publication, this special edition of Jane Jacobs's masterpiece, The Death and Life of Great American Cities, features a new Introduction by Jason Epstein, the book's original editor, who provides an intimate perspective on Jacobs herself and unique insights into the creation and lasting influence of this classic. 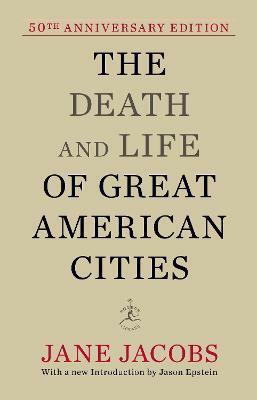 The Death and Life of Great American Cities was described by The New York Times as "perhaps the most influential single work in the history of town planning. . . . [It] can also be seen in a much larger context. It is first of all a work of literature; the descriptions of street life as a kind of ballet and the bitingly satiric account of traditional planning theory can still be read for pleasure even by those who long ago absorbed and appropriated the book's arguments." Jane Jacobs, an editor and writer on architecture in New York City in the early sixties, argued that urban diversity and vitality were being destroyed by powerful architects and city planners. Rigorous, sane, and delightfully epigrammatic, Jane Jacobs's tour de force is a blueprint for the humanistic management of cities. It remains sensible, knowledgeable, readable, and indispensable. Jane Jacobs (1916-2006) was a writer and activist who championed new approaches to urban planning for more than forty years. Her 1961 treatise, The Death and Life of Great American Cities, became perhaps the most influential American text about the inner workings and failings of cities, inspiring generations of urban planners and activists. Her efforts to stop the building of downtown expressways and protect local neighborhoods invigorated community-based urban activism and helped end Parks Commissioner Robert Moses' reign of power in New York City. Jason Epstein is the recipient of many awards, including the National Book Award for Distinguished Service to American Letters, the Lifetime Achievement Award of the National Book Critics Circle, and the Curtis Benjamin Award given by the American Association of Publishers for enriching the world of books. For many years he was editorial director of Random House. He is the author of Book Business: Publishing Past, Present, and Future and Eating.